After a few years of research, working to envelope his own style in reggae music, performing at the Rebel Salute and obtaining a position in the EU top chart with the single "Raggamuffin", YUNG JR, son of the reggae legend Junior Reid, finally released his debut EP "Start The Movement". The EP, produced in collaboration with his brother Adoney Reid, confirms the ability of Yung Jr to have exceptionall conscious lyrical abilities and a clear voice that can climb hight peaks and also unleash a powerful toasting style. 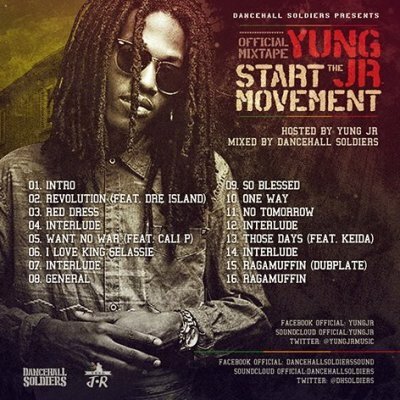 Yung JR is one of the best and talented rising star in the reggae music industry of Jamaica and Dancehall Soldiers, who recently worked on another talented youth mixtape as Iba Mahr, is proud to present the official Mixtape of Yung JR "Start the Movement" to the reggae massive! YUNG JR was born in Kingston, Jamaica on December 7, 1992 Ababa Jahnoi Reid was destined for greatness. With his father being Reggae legend, Junior Reid, music was entrenched in his DNA. From as early as three years old, Yung J.R recalls his first instrument given to him by his father as being a toy drum set. Many of his childhood days were spent in the studio owned to his father and that's where he fell in love with the creation of music. At age seven, he began recording music at a nearby studio in Kingston 6 Mona Heights. Three years later, he, his grandmother and younger sister temporarily migrated to Africa where he was enrolled at Tot for Teens for one year. Whilst in Africa, Yung J.R was a member of a drumming crew which originated at The Edna Manley School of Arts in Jamaica. Upon his return to Jamaica and completing high school, Yung J.R migrated to America where he actively began pursuing a musical career with his stage name being Yung Jr. His traveling to different continents and countries; coupled with musical influences such as Junior Reid, Hugh Mundel, Garnet Silk and Poor Righteous Teachers allowed him to develop an appreciation for diverse genres of music. It was not until he released "Voices", a remix to his father's 1996 "Listen to the Voices", that Yung J.R became cemented in the hearts of his peers as a recording artiste. Since then, he has collaborated with his father as well as underground rapper, Chris Matic to release singles such as My City (2011), and High High (2012). Some of Yung J.R’s notable achievements include the number three ranking of his debut single, Raggamuffin, on popular German Reggae/Dancehall Chart, Jugglerz, in 2013. In addition to this, the music video for his second single, General, was featured in the top 50 music videos for 2014 on the European website, United Reggae. Yung J.R is also a brand ambassador for HRB Movement, an eco-friendly Californian clothing company. During his tenure as a recording artiste, Yung J.R has appeared on numerous stage shows, at times as the opening talent for his father's performances. The year 2014 saw him performing at Reggae In The Hills in California and later at well-known Jamaican Reggae festival, Rebel Salute, where his presence was well received by patrons. 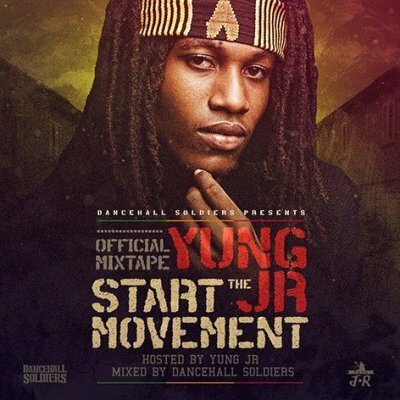 Presently signed to the JR Productions, Yung J.R has now released his debut album, Start the Movement, with his brother Adoney Reid as producer. The album hosts songs such as Raggamuffin and General, and features roots talents such as Dre Island, Cali P, Keida; and legendary music producer, King Jammys.